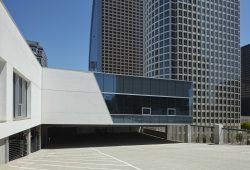 The recently completed 8th & Francisco Parking Garage is located in the western quadrant of downtown Los Angeles between Staples Center and the Financial District. Over the past 10 years this area of the city has seen substantial urban renewal and an associated increase in the demand for parking. 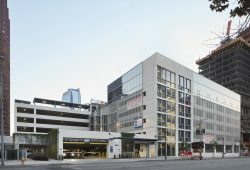 The mixed-use structure features ground-level retail and includes 560 parking spaces on six levels. 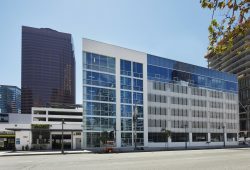 A unique feature of the facility is the 20,000 SF of office space located on the top floor of the structure. Façade enhancements include a skin of geometrically-placed metallic panels, giving it a modern urban feel. A planted bio-filtration area along the south edge of the site treats all storm water prior to discharge into the public system.